Rachael was born with Cerebral Palsy and this resulted in her being unable to control any of her limbs and that she has no speech. I have been supporting Rachael as both her advocate and less often as her adviser for almost 20 years. I first began working both with and for Rachael when she had problems with appropriate support at Annan Academy. I know that to use the word “inspirational” when related to disabled people is frowned upon but the plain and simple fact is that she is just that – inspirational!! In those 20 years with Rachael, I have never once taken a decision without her authority and as with most people who have Cerebral Palsy, she fully understands everything that is said to her. Rachael harboured a desire to live independently from her parents since her late teens – she is now 33. I must emphasise that this is not a problem with her parents who are probably the most supportive that I have ever seen. They have fully supported and encouraged Rachael to become independent. Rachael, in common with so many other disabled people, has encountered a host of different barriers in her life and has taken great pleasure in destroying every last one of them. She was verbally abused by the owner and staff of a shop in Blackpool and to cut a long story short, Rachael took them to court and with my assistance and the use of her talker, she presented and duly won her case using the DDA 1995. The shop owner was heavily fined and ordered to pay the costs of the court and to pay Rachael compensation for aggravated discrimination. The DRC was so impressed with Rachael that they asked her to become an advisor to them on severe and complex support needs. Rachael has won so many battles over the years that it is difficult to recall them all. However, the most recent was possibly the most important. Rachael had a home fully adapted to her own support needs and it was ready to move into by July 2015. However, the local authority decided that Rachael could manage with just one PA for 7 hours during waking hours. 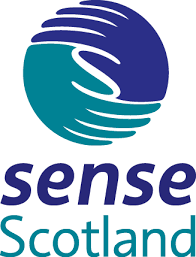 This left a £65,000 shortfall in the amount that would be required to live independently and safely. It took 21 months and many many twists and turns, with Social Work Services opposing Rachael at every juncture. This was despite a huge amount of evidence that Rachael require 2 PAs throughout the 24 hours. However, after 21 months of a protracted battle with Social Work Services she was awarded not only the original amount that she asked for but £15,000 more than she had asked for 21 months before!! Rachael now employs 8 PAs by use of a Direct Payment that she has used since 2004/5. That is just a bit of background about Rachael. As far as the use of Assistive Technology is concerned, she has used various talkers for more than 12 years. As previously mentioned, Rachael cannot use her hands to operate her talker, so she has a switch placed at the top of her wheelchair that she can control by using head movements. In fact, you can view her using the talker on Youtube. 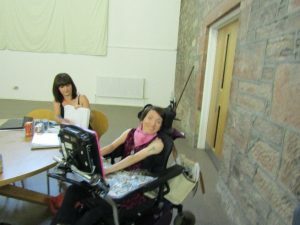 Rachael produced a video about her use of “Augmentative and Alternative Communication” for NHS Education for Scotland and this can be found at “nowhearme.co.uk”. She has also encouraged others to use make the best use of AT and is excited at the prospect of working with others on the Advisory Group for the Inclusive Information Hub. There is so much more that I could say about Rachael. However, all that I will say is that she would be a terrific addition to the Inclusive Communication Advisory Group.